And how, exactly, did Target make itself into a design mecca?) Switch explains a 3-part framework to help you change things, whether you're trying to influence your curmudgeonly coworker or your stubborn teenager. One of the greatest books ever, Made to Stick, reinforced the need for information to make sense to people. Any information needs to be (1) simple; (2) unexpected; (3) concrete; (4) credible; (5) emotional; (6) story. You should read the book, if you haven't. I also read Dan and Chip Heath's articles and blog regularly. They also write in Fast Company every month. I received an email yesterday that said they were putting the final touches on their new book, Switch. It's about a cool subject, and one we have discussed on RWA before: CHANGE. 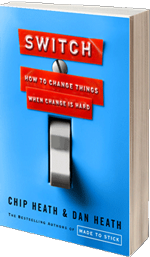 The subtitle is "How to Change Things When Change is Hard." The Heath boys are at it again. Their new book Switch will arrive in February.